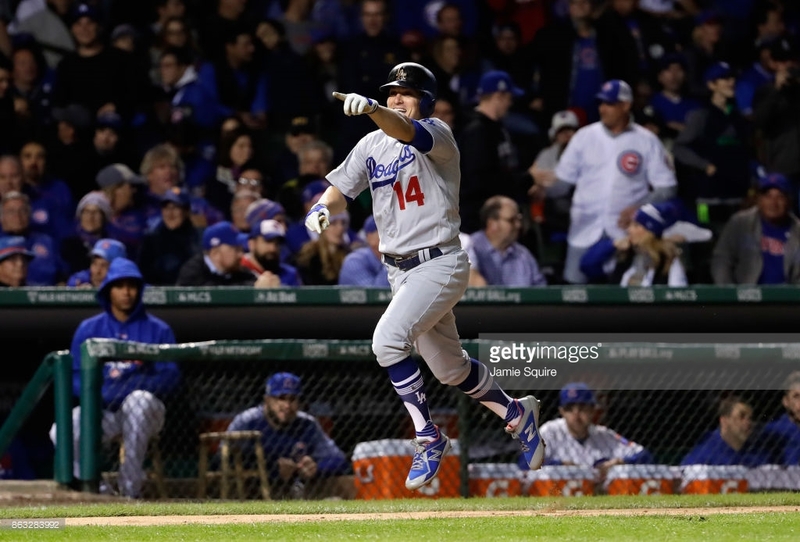 The Los Angeles Dodgers offense struck early in game five and after an Enrique Hernandez third inning grand slam, it seemed as though the Chicago Cubs fate had been sealed. It was Hernandez’s second homer of the night, after he snuck a solo shot into the Wrigley outfield baskets in the second. The native of Puerto Rico would not stop there. He put another ball in the seats in the top of the ninth, this time for a two run shot. Those were Hernandez’s first three career postseason home runs. Outside of the six runs between the second and third innings, the Dodgers also hung a run on the board in the top of the first when Chris Taylor, who is having quite a 2017 postseason, scored from first on a Cody Bellinger double. Logan Forsythe would drive in two more in the fourth to end the Dodger scoring until Hernandez capped off his career night in the ninth. Cubs starter, Jose Quintana, was pulled in the third after facing four hitters without recording an out. After allowing just two runs through 11.1 innings in the 2017 playoffs, Quintana’s first postseason ended with a line that read 2 IP, 6 ER, 6 H, 1 SO. The man on the bump for the visiting team fared much better than his counterpart. Future hall of famer Clayton Kershaw, who is often criticized for his postseason pitching performances, pitched all night as if his club was trailing. Kershaw struck out five in his six innings of work while allowing three hits and making just one mistake on the night. That mistake came on the first pitch to Kris Bryant in the bottom of the fourth when he put the Kershaw offering in the left field bleachers. After Kershaw called it a night, the Dodgers bullpen continued to own the Cubs as they have all series. Three combined shutout innings from Kenta Maeda, Brandon Morrow, and Kenley Jansen put a bow on a game that will be remembered forever by Dodgers as the blowout that gave them their first NL pennant since 1988. At this point, the Dodgers look unstoppable. With the offense firing on all cylinders and the pitching staff dealing from the starting rotation all the way through the bullpen, whoever comes out of the ALCS with have a battle on their hands. With game one of the World Series set for October 24th, the Dodgers have plenty of time to recover before the fall classic.